Last week was filled with a myriad of professional development. I flew to Chicago and spoke to an audience of 250 women engineers and gave them some pearls of wisdom. Friday I attended a leadership workshop. Former Shell executive and mentor of mine, Susan Hodge and her partner Lynn Rousseau with Women Leading Together helped us explored our energy to live a fulfilling life and career. One of the exercises revealed something I already knew about myself but for the first time ever, I felt comfortable sharing it. So I did. I stood proud and told all 15 women with a big smile, “I love winning.” The room chuckled, but I know what they were all thinking … “So do I…”The fact is we all love to win. It’s human. Winning means different things to different people. For me, it’s about getting better. I’ve always been competitive with myself. I get a lot out of setting goals and then growing to accomplish them, and then finding new things to “go for”. Sometimes, though, I win on sheer luck. This spring my husband and I went to the local bingo hall for date night and I won a $750 jackpot. The only thing we did right that night was go play bingo! Most of the time, though, I win because I’m working towards a goal. You say…”Oh, but I never win anything? !” Want to win? Follow these simple steps. Start something, today. Move forward. Surround yourself with other winners. Fail – Never ever, waste a good setback. 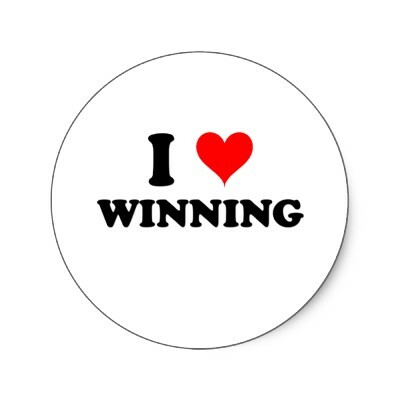 When and what have you done to win lately? Do you like winning as much as I do? Tell us about it…. I hear ya. We are our best competitors!